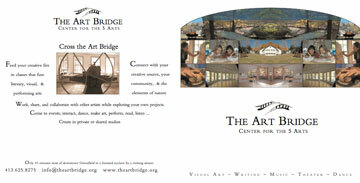 Diane Clancy and Susan Elkin design and update programs, booklets and newsletters. They can create new booklets, newsletters and programs or just make the changes you need. Beth Caurant, who is a musician, songwriter and founder of Lilith (one of the first, successful all female bands), says, "I had been planning to archive my collection of Lilith memorabilia for a few years. My work with Diane began in 2003 when I asked her to scan my photos of the band onto disc. ... If you have any digital work that you need done, you will find Diane's work exceptional. And just as important, working with her was a breeze." Dalton Athey says, "Text, pictures, and graphic art design, each in their own right are powerful and critical to delivering a message, but in combination the synergy is truly effective. Diane and Susan work seamlessly to get the most of all three, a truly powerful combination." Their specialty is implementing your own ideas for your projects to showcase your work. Please give Diane Clancy a call at 413.773.7333.